Dallas’ source for Kids Superhero Costumes is Dallas Vintage Shop. From Deluxe Costumes to Economy Priced Costumes, we have any Kids Costumes for boys or girls that you can imagine. 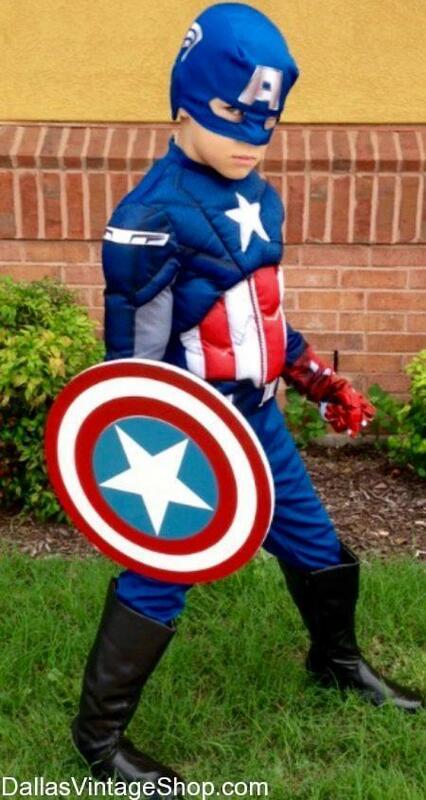 Get Kids Superhero Costumes, Boys Captian America Superhero Costume, Kids Marvel Superhero Costumes, DC Boys & Girls Superheores and Super Villains at Dallas Vintage Shop. Our Kids Superhero Costumes for boys and girls come in all kids sized, DC, Marvel and Movie, Cartoon and Comic Book Characters Costumes too. The DFW areas source for Kids DC & Marvel Movie Superhero Costumes is Dallas Vintage Shop. We have Deluxe Costumes, Economy Costumes and Median Priced Costumes for boys or girls. Get upgraded Superhero accessories for kids or adults too. Dallas Vintage Shop has Mens Marvel Costumes like Captain America, Iron Man and many other male Super Heroes. You are in Captain America category.